Why is the whole “Jiro Dreams of Sushi” documentary spoken in Japanese rather than having an English voiceover? In Jiro dreams of Sushi (2011), director David Gelb could have used an interpreter for the interviews to present the information in English. Instead, the whole documentary is in Japanese with English subtitles. Why do you think that the director took this approach? @ThisIsDavidGelb - Please turn on original audio and subtitle in the settings! The show is not meant to be dubbed. @victormarkwhat - Thank you! This is great to know. I just came across your twitter because we were watching Chefs Table S4:E2, did not like the dubbing. We were wondering if anybody else felt the same. Much better with subtitles! 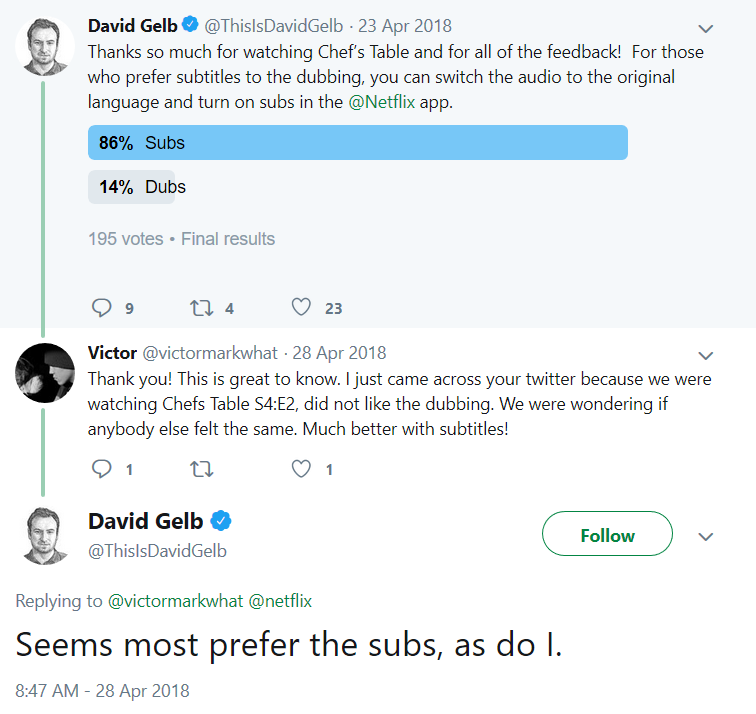 @ThisIsDavidGelb - Seems most prefer the subs, as do I. Not the answer you're looking for? Browse other questions tagged jiro-dreams-of-sushi .